One of the great things about a motorhome is its versatility. It’s a machine that is designed to do a lot of things. You can drive to unique locations in it, sleep in it, cook in it, and yes tow with it. Towing with your motorhome opens up a lot of new options, like bringing a boat along with you on your travels. Before you just hitch up the boat and set off, though, there are a few things you need to think about and know. 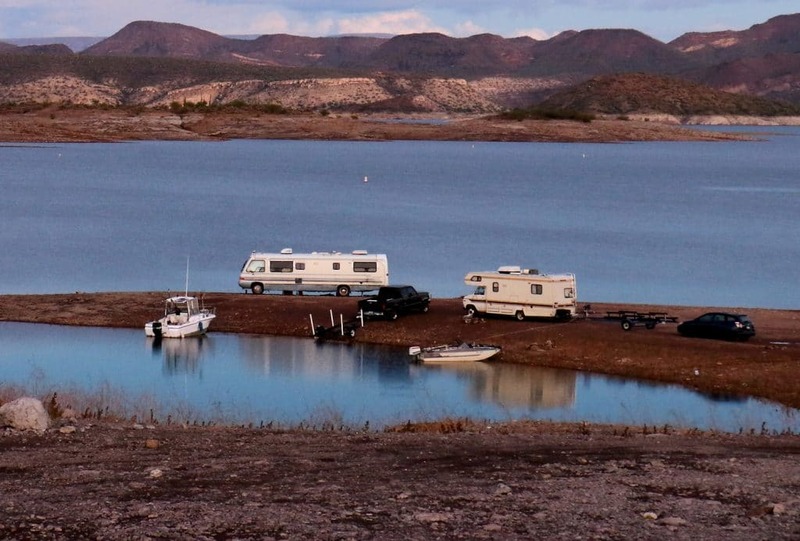 Here are some tips you should know before towing your boat with your RV on your next adventure. Towing capacity means how much weight your motorhome is rated to tow. Some RVs can tow up to 5,000 pounds. Others can tow much more and some much less. Before you hitch up your boat, find out the weight of it and your trailer combined and make sure it aligns with your RV’s towing capacity. Also, you need to make sure your hitch is rated to handle the load. Not all hitches are the same, and a low-class hitch will dictate how much you can tow even if the vehicle is capable of actually towing more. You also need to think about the hitch’s max tongue weight, which is how much weight the trailer tongue can weigh. In fact, there are five different classes hitches you can have on the back of your motorhome. A Class I hitch can tow up to 2,000 pounds and has a 200-pound max tongue weight. A Class II hitch can tow up to 3,500 pounds and has a 300-pound max tongue weight. A Class III hitch can tow up to 6,000 pounds and has a 600-pound max tongue weight. A Class IV hitch can tow up to 10,000 pounds and has a 1,000-pound max tongue weight. Finally, a Class V hitch can tow up to 12,000 pounds and has a 1,200-pound max tongue weight. Also, weight distributing Class III, IV, and V hitches can tow more. 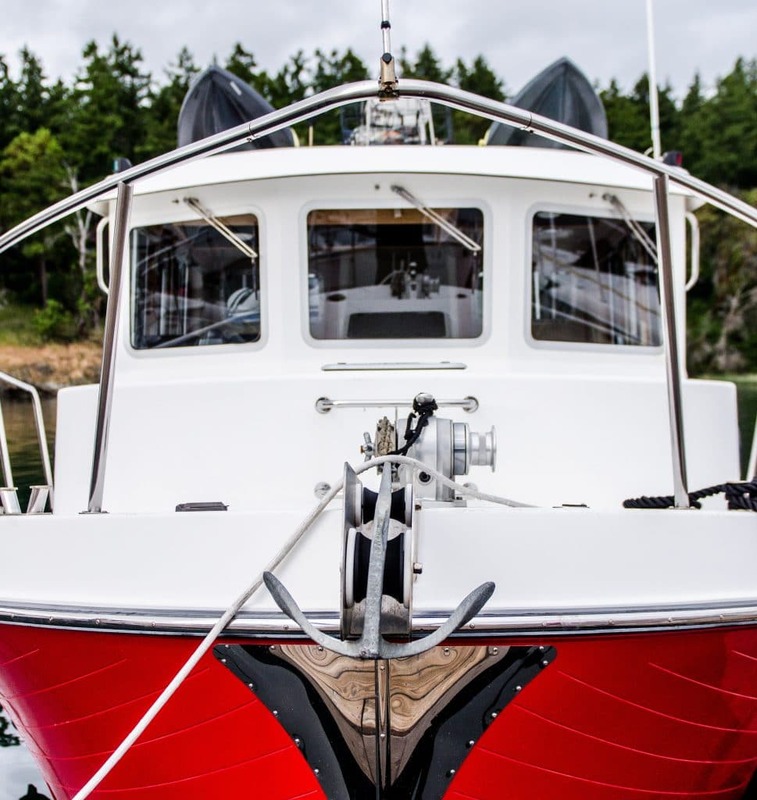 If your boat weighs less than your motorhome’s towing capacity, and you have the right hitch for the weight of the boat, then you should be mechanically able to tow the trailer and boat with ease. 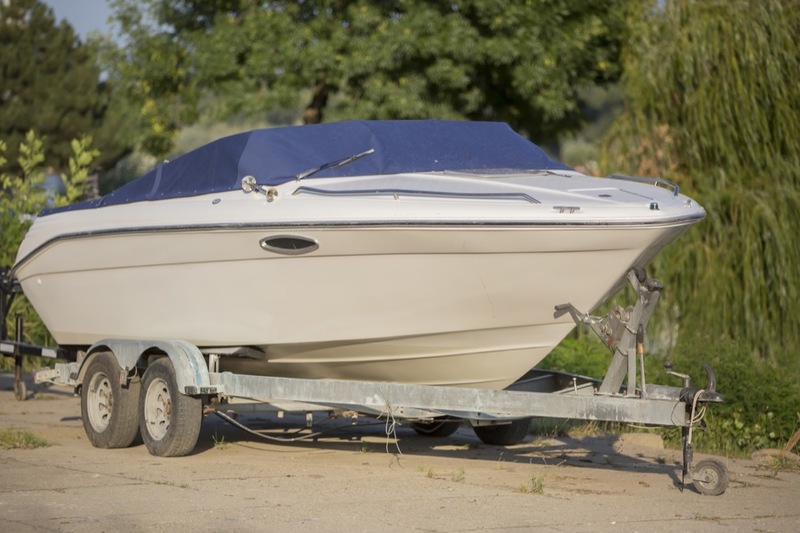 When it comes to hooking up and actually towing the boat trailer, you need to make sure you double check everything. Is the trailer properly connected? Do all the trailer and vehicle lights work? Is the boat securely on the trailer and tied down? We strongly suggest having a few ratchet strap tie-downs to help ensure the boat is secure on the trailer. Also, make sure to check that there’s not anything in the boat that can blow out as you travel down the road. 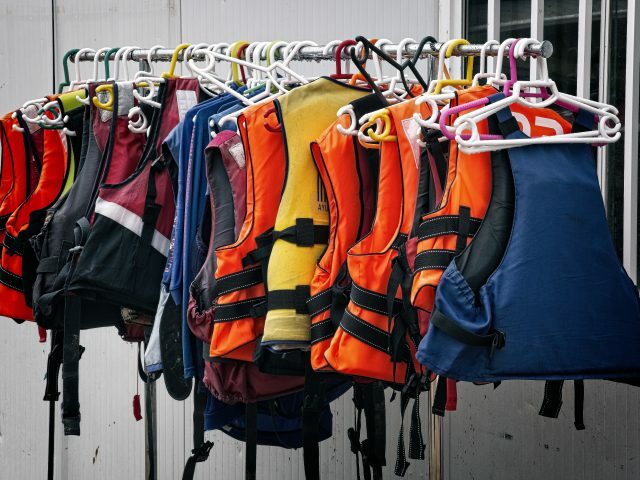 If you’re transporting your boat without a cover, the last thing you want to do is lose a life jacket or some other boating supplies along the highway. Make sure everything is securely stowed away. Also, double check everything on your RV. Are the tires in good condition? Is the engine running properly? Are the fluids topped up? 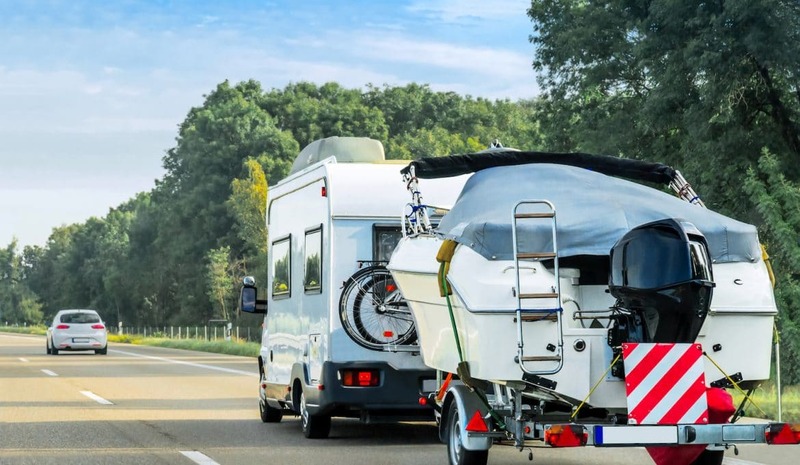 You need to focus on your tow vehicle—the motorhome—as much as you do the boat you’re towing. A friend or family member that can help out is a must. Even if you’re a seasoned tower with your pickup truck, towing a boat with an RV poses a unique challenge. Rear visibility is not as good as it is in a pickup truck, and this can make things difficult. 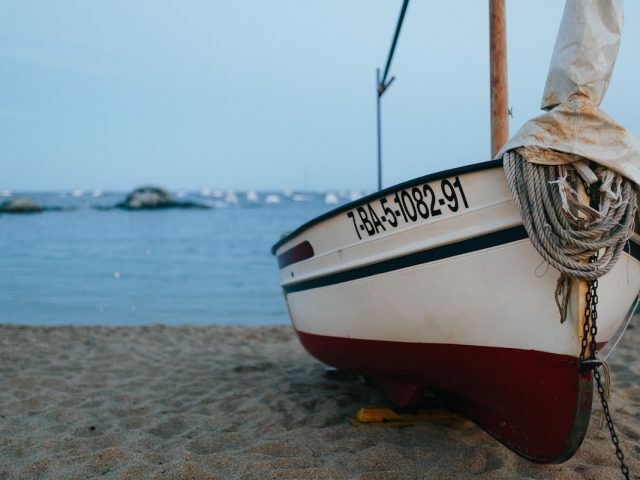 Have your friend or family member work as your spotter when hitching up, disconnecting, or putting the boat in and taking it out of the water. Having a helping hand never hurts. Your spotter can help you every step of the way, and there’s really no reason not to have one. Rear visibility in a motorhome isn’t as good as a truck, SUV, or car. It’s just plain harder to see out of the back of a motorhome. Most RV’s will already come with large side mirrors, but if yours does not, consider adding some large tow mirrors to your camper. Also, It’s always smart when towing to add a backup or rear-facing camera. This way you can see exactly what’s going on behind you. Many RVs already come prepped for the addition of a rearview camera. Even if yours doesn’t, there are plenty of great rearview cameras out there for you to check out. Last but certainly not least, we would caution you to take it slow. If you’re in a rush, something bad is likely going to happen. Don’t let others rush you, and try not to get too excited while towing. It’s so easy to get pumped up and ready to go for your fishing trip or day out on the water, but the moment you start getting too excited, you may start rushing and make a mistake. Take your time and use your spotter and you should have few issues. Another thing you need to do is to practice. 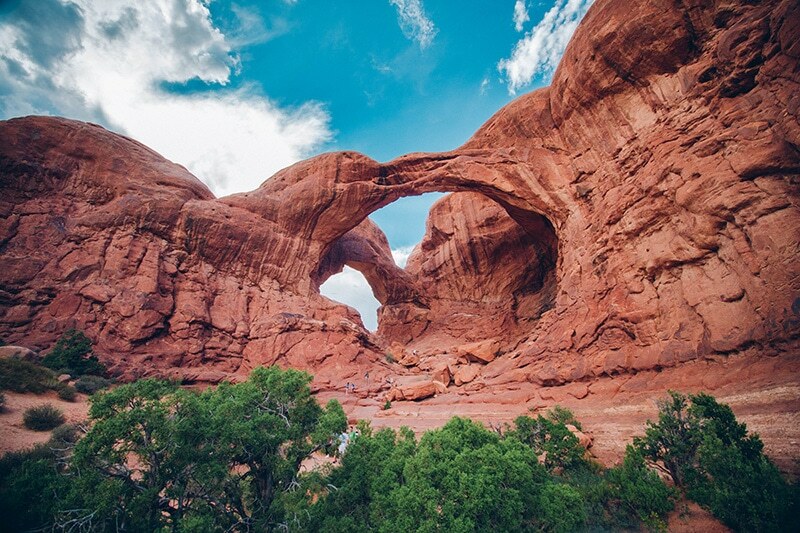 Take your rig out on some shorter, local trips, and work on taking things slowly and getting everything right. The more you tow with your motorhome, the better you’ll get at it. 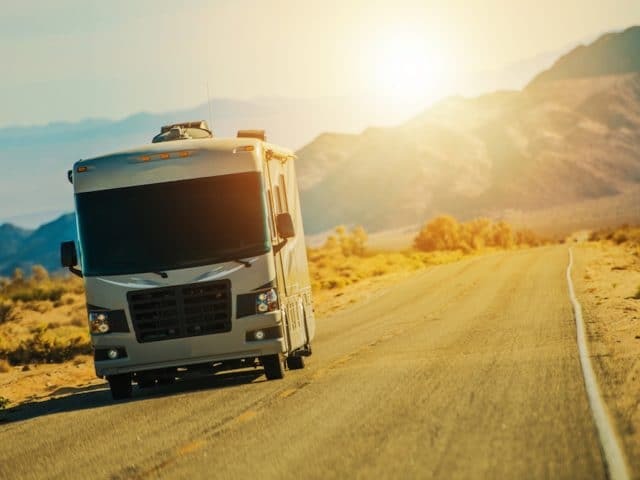 By following the tips above and sticking to the towing practices you already know, you should be able to successfully tow your boat with your RV. 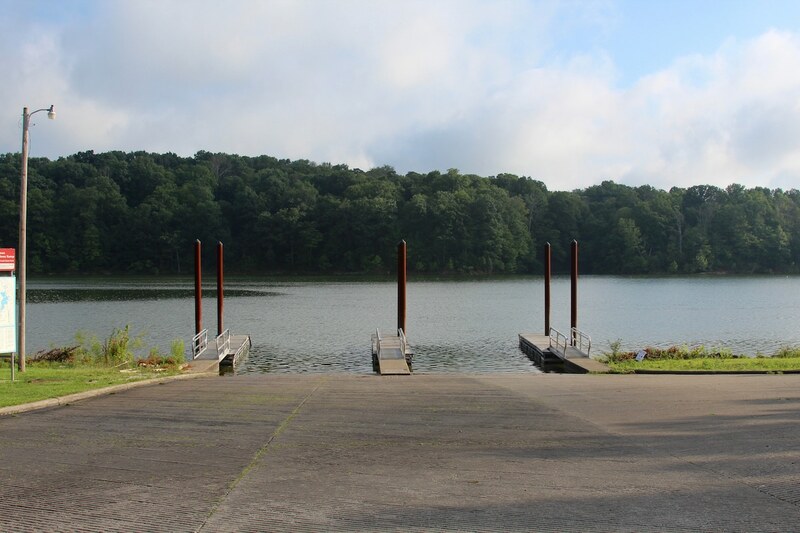 Do you have any tips for RVers who want to tow their boat? Leave a comment below.